For three days, from Dec.8th to 10th in 2017, Dongguan International Science and Technology Exchange and Cooperation Week” was held under the auspices of Science Technology Devision of China and Peoples government of Guangtong Province, in Guangdong city, China, following by last year. Team-E Kansai set up the exhibision booth called ” Japan-China energy saving and environmental cooperation Pavilion”, togather with 46 companies including Team-E Kansai member companies. 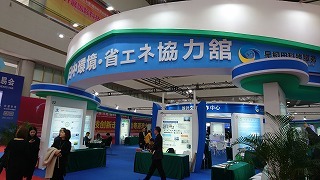 Technology introducing panel of three member companies which promote the project cooperated with Guangdong Province and Kansai together with the local partner companies, and five issues which would possibly chosen as the project were exhibited. 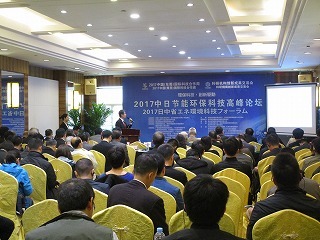 On Dec. 9th, 3 member companies made their presentation about technology after the keynote speech by Mr. Asai, the director of trade department of Kansai Bureau of Economy, Trade and Industry of Japan, at “Japan-China Environmental Protection Science and Technology Forum” held under the auspices of Guangdong Science and Technology Department and JETRO Guangzou, followed by business meeting with local companies. "China (Dongguan) International Science and Technology Exchange and Cooperation Week" and " Japan-China Environmental Protection Science and Technology Forum"